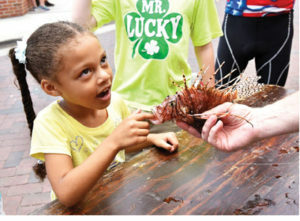 The Florida Fish and Wildlife Conservation Commission (FWC) is excited to announce the fifth annual Lionfish Removal and Awareness Festival May 18 and 19 at AJ’s Seafood & Oyster Bar and Harbor Walk Village in Destin. Come out and celebrate the fight against invasive lionfish with the FWC and the Emerald Coast Convention & Visitors Bureau. Activities will include: fillet demonstrations; family-friendly games and activities; art, diving and conservation booths; and the world’s largest lionfish spearfishing tournament, the Emerald Coast Open. Satisfy your taste buds by visiting any of the participating locations of Lionfish Restaurant Week (May 10-16) for your opportunity to try this delicious invasive. Learn more by visiting ReefRangers.com. Interested in having a booth at the event? Apply today. Do you harvest lionfish? Register for the Emerald Coast Open lionfish tournament. Interested in being a volunteer or sponsor? Learn more at EmeraldCoastOpen.com. Thanks to our Gold sponsor, Reef Safe Suncare. The 2019 Lionfish Challenge removal incentive program will begin May 18 and continue through Labor Day (Sept. 2). More details on how to get rewarded for your harvest coming soon to ReefRangers.com. What is Lionfish Removal and Awareness Day? Lionfish Removal and Awareness Day (the first Saturday after Mother’s Day each year) raises awareness about lionfish, a nonnative, invasive species that has the potential to negatively impact native species and habitat. Questions? Contact the FWC Division of Marine Fisheries Management at 850-487-0554. Links. Support Florida lionfish control programs by purchasing new Rep Your Water lionfish hats from the Fish & Wildlife Foundation of Florida.